10/10/10. We are just about to leave for Southampton. 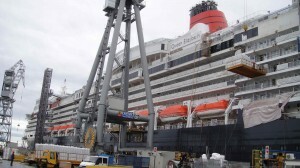 Tomorrow we board QE. Great news. We will be there to see her on 11 Oct. If you plan to be on this voyage, please add your comments and notes here. This is what we expect our state-room to look like.